Almost all business owners need to have a mobile presence. But when it comes to building the app they face a dilemma. How do they do build an app? They generally don’t want to pay a developer an armload to build that presence. They would rather do it themselves, but there’s no point in having a mobile presence if it’s just going to look sloppy. That just hurts the brand. 1) What is the best way of developing an app on multiple platforms without necessarily tweaking code for each native? 2) What is the best way to develop apps without constant revision? 3) What is the best way of controlling the versions of the apps without losing track of the implied semantics and purpose of the app? 1) Appmakr, now part of Infinite Monkeys (Apple iOS, Windows Phone, Android; paid plans start at $9 per month plus a $199 one-time fee for self-publishing capabilities) - If you're looking for simplicity, this barebones development service lets you build a native Android app plus HTML5 mobile Web site for free, if you allow in-app advertising. The service includes analytics, along with RSS and push services to help you market your mobile app when it's finished. 2) Mobivite - India based Mobivite helps you create beautiful looking mobile apps & WAP site very quickly and easily. 4) Appcelerator –Deliver native cross-platform apps at the speed of web, mobilize any data source, and drive success with real-time analytics – all from an open, cloud-based platform. Open source version of this app is free. 5) AppBuilder - Quickly create apps without writing a piece of code. Works across platforms and give you real time preview as you develop. You can even create commerce apps by adding cart functionality. 6) App Press - Create native apps on the fly for Android & iOS with drag & drop features. No coding experience needed. 7) Attendify (Android, Apple iOS, HTML5; starts at $399 per year per event) - The specific focus of this development platform is to support companies that run events, and that want to create mobile apps with schedules and content to support them. It also offers features meant to encourage attendee engagement, such as an activity feed or messaging. 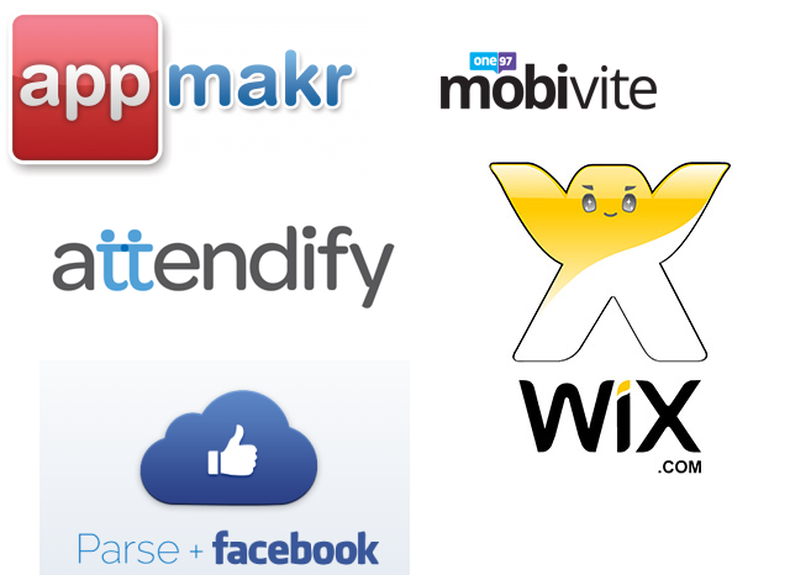 8) Wix – For small businesses that already use the Web publishing resources of Wix.com, the developer last month acquired code-free mobile app development platform Appixia. The focus of the platform, currently in transition, is on creating mobile commerce apps.